Salmon and halibut are the biggies (literally and figuratively) in the guided sport-fishing world, but the ocean has much to offer. Rockfish, with their distinct orangey-red coloring, are a fun challenge and have a nice, mild flavor. There are many species, and all are delicious and visually appealing. 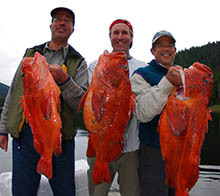 Lingcod (bucketheads) and blackcod (sablefish) are regularly pulled from the depths. Blackcod is often the secret favorite of folks who feel a certain loyalty to the King Salmon, but can’t resist the especially soft and savory white meat of a blackcod, which particularly lends itself to smoking. Away from the salt, species of trout can be found in a nearby freshwater creek should you want to focus on fly-casting for a day. Options about, and you never know what will take the bait when you’re out on the water. Every day of you Alaskan Experience is an adventure. For more information on Alaskan fishing, contact Alaskan Experiences today.